Description: "House plants are fun when they grow well, producing new flowers or leaves often. For this to happen you have to know how to look after them properly. In this book you will only find plants that are easy to grow. Most of these are green plants, that is, plants that are grown for the beauty of their leaves. Some flowering plants are easily cared for too, and so are bulbs and most cacti." Apart from the usual fare of geraniums, begonias, and azaleas, the book features several interesting and unusual species of plant, such as mother-in-law's tongue. Also contains information about propagating plants from seed(ling)s and cuttings, plus tips on choosing a suitable location for growing. Illustrated throughout with two-colour pink monochrome drawings. 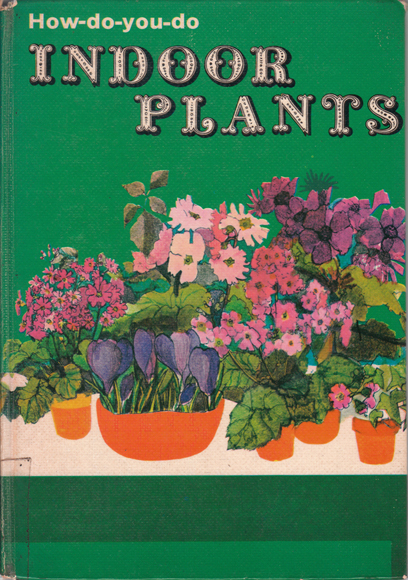 Pastedowns and endpapers are decorated with depictions of various plants. Textured pictorial boards have been laminated. Corners are straight, but the upper are rubbed. Spine is bumped with slight damage to the head (refer to image). Being a former public library book, there are several stamps present on the first and last two pages and pastedowns. Two hand-written inventory numbers are present on the fep and verso, and the remains of the lending record can be found on the former. Unusually, most pages are of alternating colour – the first two are magenta; the two that follow are white; the next two are magenta; their successors are white; and so on. The white pages have some minor foxing near their edges, whilst the coloured ones haven't a single speck. No other marking is present on the crisp, bright pages, other than that already mentioned. Binding is sound. Measures 24 cm × 16.5 cm (9.5″ × 6.5″). Large 8vo. 29 pp.